We’d love your help. Let us know what’s wrong with this preview of The Predators' Ball by Connie Bruck. During the 1980s, Michael Milken at Drexel Burnham Lambert was the Billionaire Junk Bond King. He invented such things as "the highly confident letter" (I'm highly confident that I can raise the money you need to buy company X) and "the blind pool" (Here's a billion dollars: let us help you buy a company), and he financed the biggest corporate raiders--men like Carl Icahn During the 1980s, Michael Milken at Drexel Burnham Lambert was the Billionaire Junk Bond King. He invented such things as "the highly confident letter" (I'm highly confident that I can raise the money you need to buy company X) and "the blind pool" (Here's a billion dollars: let us help you buy a company), and he financed the biggest corporate raiders--men like Carl Icahn and Ronald Perelman. To ask other readers questions about The Predators' Ball, please sign up. Of all the financial industry tell-alls of the 1980s, this has to be the most detailed and comprehensive. While writers like Bryan Burroughs, in books like "Barbarians at the Gate," focused on personalities and relationships, Connie Bruck peaked inside the intricate system of junk bond financing that Michael Miliken pioneered at Drexel Burnham Lambert, and explained how such subtle innovations as refinancing bonds and private placements led him to become the most richly rewarded man in the world, and then, of course, a convicted felon. Bruck presents an admirably balanced picture of Milken, as both a driven genius and an occasionally underhanded dealer. At first, one cannot read the book without admiring Milken's intelligence. Taking the research of W. Braddock Hickman from the 1940s, Milken showed his bosses how buying large, diversified portfolios of low-quality corporate bonds, i.e. "junk bonds," would allow them to outperform the competition. Even if a few defaulted, he argued, the high interest on the whole would be greater than supposedly safe triple-A bonds. More than that, Milken, son of a Los Angeles accountant, had an uncanny ability to divine good companies from their balance sheets and statements, and very few of his supposedly junk bonds defaulted. This made him and Drexel the fastest growing financiers in the country. After building up a dedicated cadre of thrift institutions, wealthy individuals, and mutual fund clients, all of whom would buy any bonds Milken offered on pure faith, Milken then transformed that vast reservoir of cash a into a tool to raise money for hostile takeovers. These junk-bond financed raids allowed such previous nobodies as Nelson Peltz of Triangle Industries to take over National Can Company, or Ronald Perelman and his Pantry Pride supermarket chain to take over Revlon. As the section is titled, pawns captured kings. Soon Milken became the center of a vast web of money and companies that funded takeovers, purchased stocks, and distributed vast funds across the nation. He also became a walking conflict of interest who accumulated loads of insider information from his diffuse clients. Then, a U.S. Attorney named Rudolph Guiliani and a crusading SEC finally put him in prison for two years, fined him billions, and pushed Drexel into bankruptcy. Bruck is best in the weeds. She relates how Milken's "stripping" of stock warrants (originally requested as "kickers" to help sell supposedly bad bonds) from bond offerings, and the placing of such warrants and stocks with close friends who were at his beck and call, allowed him to accumulate large positions in companies before filing an SEC 13D form admitting to at least 5% ownership, and thus gave him the nebulous power to potentially threaten almost any CEO in the country. Few knew how much potential stock he controlled. Bruck also shows how Milken's 3(a)9 deals, that is, private placements of bonds that did not have to register with the SEC, but, contrary to Milken's actual practice, which were not supposed to be quickly traded, allowed him to create sudden streams of funds to use against takeover targets. Also, Bruck points out how Milken's "highly confident" letters, stating merely that his firm strongly believed it could raise, say, $100 million in a few weeks, were enough to make many corporate chieftains quake in their loafers and then to make them offer him large payouts to stay away from their companies. Although he didn't originate such "greenmail," he made it ubiquitous. Good depiction of Milken’s rise, but I would have appreciated an appendix with a further update. What specifically was he convicted of and what was the punishment? How did this compare with other similar cases? What has he done since getting out? The writer would like us to believe that his transgressions dramatically overshadow his contributions, but I am not entirely convinced. I enjoyed 'Barbarians at the Gate' and wanted to read something like it. Unfortunately, this book doesn't compare. It is a collection of stories and the chapters largely have to do with certain people that benefitted from Michael Milken's efforts. It doesn't have a strong story arc and seems to leave us in suspense at the end. Okay book but there are better ones. Hey, remember in the mid-2000s when the real estate market was hot and a few people said “These are not great investments, this will end badly” but nobody listened? It happened in the 1980s too. And no one truly got what they deserved. Great financial history book. All about the genesis of the global HY market. Well researched and written despite luck of collaboration from the main character. Entertaining read about the excesses and dynamism of the 1980s. Great history lesson on the development of junk bonds and the central figure, Michael Milken, behind their acceptance. A bust in the model? In their 1985 annual report, the President's Council of Economic Advisers had weighed in with its conclusions, surprising only in their ambitiousness. They purported to settle once and for all the decades-long debate over whether takeovers are beneficial or harmful. This august council concluded that mergers and acquisitions "improve efficiency, transfer scarce resources to higher value users, and stimulate effective corporate management." The conclusion was remarkably definitive but, apparently, more polemical than proven. In some of the more interesting testimony that emerged from the congressional hearings on takeovers, F.M. Scherer, a Swarthmore College economics professor, had rebutted the Council's findings. In his testimony in March 1985 he pointed out that the report's conclusion that takeovers improve efficiency relied on stock market event studies, which are short-run in orientation (examining stock prices during periods ten to thirty days before and after the announcement or consummation of the merger). If one looks at a period of ten years or so, Professor Scherer testified, the results are very different. Scherer has developed the premier data base in this country for looking at the financial consequences of merger. This data base draws upon twenty-seven years of merger history and seven years of sell-off history for nearly four thousand individual businesses. - Contrary to the Council's view that merger-makers sought companies where management had failed, most in fact targeted well-managed entities. What they were generally attracted by was not sick companies or slipshod management but undervalued assets. - Takeovers by firms with no managerial expertise in the acquired company's line of business tended to impair, not improve, efficiency. - Takeovers frequently led to short-run profit-maximizing strategies, such as the "cash cow" strategy under which "a business is starved of R & D, equipment modernization, and advertising funds, and/or prices are set at high levels inviting competitor inroads, leading in the end a depleted, non-competitive shell." - On average, acquisitions were less profitable for the acquiring firms than the maintenance of existing businesses and the internal development of new business lines. - Many of the takeovers led to selloffs, which did improve the efficiency of the simpler, self-standing entity. - While Scherer had relatively few hostile takeovers in his sampling, in those he did study he found that the takeover aggravated performance deficiencies that existed earlier. In response to questions from panel members, Scherer also made and interesting point about the high-leverage, or debt-intensive, capital structures of many U.S. companies, which are coming to resemble Japanese companies' financial structures. Indeed, in the gospel according to Milken which is spread by so many of his acolytes, it is often noted that Japanese companies have for years carried much higher debt-to-equity ratios than American companies. True enough, Scherer commented, but the Japanese are able to carry such high levels of debt because when they get into financial difficulties the government bails them out. Bruck provides lots of highly detailed reporting about The Inside Story of Drexel Burnham, but largely ignores her book's advertised claim to perspectivize the Rise of the Junk Bond Raiders. This book is too long (by at least a quarter), often repetitive, and insufficiently interested in describing the larger macro-economic backdrop that gave rise to junk bond raiding. Having read several of Bruck's long profiles of business persons, my general conclusion is that she spends too much tim 2½ stars. Having read several of Bruck's long profiles of business persons, my general conclusion is that she spends too much time gathering & reporting facts and too little effort articulating what her findings mean or imply about the zeitgeist. As the tale of one person's empire building, innovating whole new realms while also transgressing ethical and legal norms, this text has a great deal in common with Robert Caro's The Power Broker. This book is a probing look at the mechanics of Michael Milken's seizure of power in corporate finance. That said, there are two faults I have with this: first, that the action described takes place in a little over a decade; the events seem to pile on top of each other, giving little sense of chronolo As the tale of one person's empire building, innovating whole new realms while also transgressing ethical and legal norms, this text has a great deal in common with Robert Caro's The Power Broker. This book is a probing look at the mechanics of Michael Milken's seizure of power in corporate finance. That said, there are two faults I have with this: first, that the action described takes place in a little over a decade; the events seem to pile on top of each other, giving little sense of chronology. Secondly, and probably more importantly, the action takes place solely at the level of shareholders and board members - the effects of Milken's action on, say, company employees or regulators is glossed over. Extremely well-written. Presents the junk bond financing market's birth and its aftermath. In the 1970s and 80s, small & medium companies were hard-pressed to find financing for expansion. Banks were inclined to lend only to blue chip companies. At its best it would have be Extremely well-written. Presents the junk bond financing market's birth and its aftermath. In the 1970s and 80s, small & medium companies were hard-pressed to find financing for expansion. Banks were inclined to lend only to blue chip companies. At its best it would have been a wonderful invention to allow non-blue chip companies acquire necessary funds for R&D and expansion. The book, however, presents Michael Milliken and Drexel Burnham in an even more incestuous circle with its customers. Often the financing would be contingent on DBL acquiring a stake in the company in addition to its fees. Further, DBL would often raise and extend more money than the company needed, further inflating its billings. Great book, though the author has an odd way of referring to herself as "this reporter" and may editorialize when she might be better to cite. The other shortcoming of this book is that it doesn't go long enough. It goes up to Milken's indictment, but not through his conviction, and it doesn't discuss the fall of RJR Nabisco, the junk bond market crash of 1989, the role of junk bonds in the S&L crisis, the bankruptcy of Drexel, or how and why the junk bond market survived. It would also be i Great book, though the author has an odd way of referring to herself as "this reporter" and may editorialize when she might be better to cite. The other shortcoming of this book is that it doesn't go long enough. It goes up to Milken's indictment, but not through his conviction, and it doesn't discuss the fall of RJR Nabisco, the junk bond market crash of 1989, the role of junk bonds in the S&L crisis, the bankruptcy of Drexel, or how and why the junk bond market survived. It would also be interesting to look at the lecture tours he has gone on since he has gotten out of prison. It deserves another afterward. 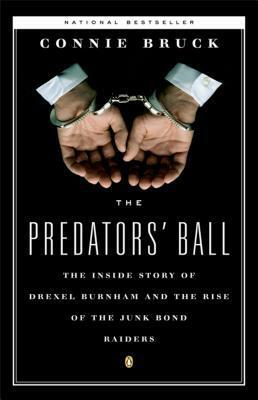 The Predators' Ball tells that story of corporate raiders, who were people that basically bought up companies that were not doing to well, revamped them and then sold them for profit. This tells the story of one of those raiders that got blindsided by lawsuits from the SEC for numerous financial crimes and subsequently saw their empire crumble. I liked this book because it showed what can happen when people get wrapped in the guts and glory that is Wall Street. Most people would like think that The Predators' Ball tells that story of corporate raiders, who were people that basically bought up companies that were not doing to well, revamped them and then sold them for profit. This tells the story of one of those raiders that got blindsided by lawsuits from the SEC for numerous financial crimes and subsequently saw their empire crumble. I liked this book because it showed what can happen when people get wrapped in the guts and glory that is Wall Street. Most people would like think that anyone who went from being poor to rich would retain some sort humble nature. This is not true. Most people would just forget about it and continue. Furthermore, they tend to think that the law does not apply to them and will do anything for a quick buck. I think that this book displayed that idea pretty well. Outstanding book that takes complicated material and a sensationalized era and makes it all contextualized, accessible, and clear. I hadn't realized how big a role fixed-incomes played in all that has gone wrong over the past thirty years, but Bruck makes it clear -- no less an analyst and commentator than Michael Lewis (Liar's Poker) stated as much to us when he conference-called with our Viewpoints class in February 2010. Bruck is the one who taught me how and why this is so. She is equally goo Outstanding book that takes complicated material and a sensationalized era and makes it all contextualized, accessible, and clear. I hadn't realized how big a role fixed-incomes played in all that has gone wrong over the past thirty years, but Bruck makes it clear -- no less an analyst and commentator than Michael Lewis (Liar's Poker) stated as much to us when he conference-called with our Viewpoints class in February 2010. Bruck is the one who taught me how and why this is so. The author did an immense amount of work and packed it into a piece that reads fairly well for a historical account. This is one of the more important stories to understand in light of today's issues. The rise of the Junk Bond raiders isn't just the rise of the Junk Bond era, it is the rise of how this type of debt made it to market and took off. It is a story that explains what- despite all of the news in the press against sub-prime - the purpose of this debt is (outside of lining the pockets o The author did an immense amount of work and packed it into a piece that reads fairly well for a historical account. This is one of the more important stories to understand in light of today's issues. The rise of the Junk Bond raiders isn't just the rise of the Junk Bond era, it is the rise of how this type of debt made it to market and took off. It is a story that explains what- despite all of the news in the press against sub-prime - the purpose of this debt is (outside of lining the pockets of deal makers). The rise and fall of Michael Milkin and DBL - pertinent again today. Junk bonds that for the most part weren't junk, until political pressure was exerted by the NYC DA. Milken was later brought down by Rudy Guiliani as part of his political plan to become mayor of NYC. Milkin did some illegal things, but no more than was standard operating practice at the time at many of the large firms, almost all of whom escaped Guiliani's vengeance. I was looking for a book that would give me a broad perspective on the junk bond controversies of the 1980s, and this book left me disappointed. It was too detailed and rambling for my purposes, and it lacked the vivid characterizations and drama of Barbarians at the Gate. The author relied heavily on quotes from Drexel's critics and Milkin's earlier public testimony and depositions to describe his activities. I read this book about ten years ago, and I enjoyed it a fair bit at the time. Recently I have been mostly struck how it was a fairly good analogue to the recent financial crisis - low-rated bonds being re-securitised and sold as highly rated products. This seems to have been forgotten by the mainstream media, sadly, who's rigour when reporting on financial matters is... about as good as it is on computing matters :-/. Definitely a good read. I can see why this is a classic business book and certainly interesting to read when considering the whole debt crisis we went through just a couple years ago and are still feeling the effects from. This is another example of how little we learn from our own history and how predictable these cycles of loose money leading to questionable behavior leading to tightening of the money which takes us back to the beginning are. The characters change but the pattern remains the same. My disappointment and anger would be higher if I was writing a review when the book was written in 1988. Ironically this books seems rather out dated. What's the big deal? The people on Wall Street take advantage of the middle and lower class and get filthy rich in the process. And that's unfortunate for me because I'm in the middle class. "A fascinating portrait of how the ambitious Michael Milken took a second-tier brokerage and transformed it into a short-lived powerhouse by pushing high-yield junk bonds and using them to fuel the leverage buyout mania of the 1980s. Amazing how easily investors fell for his schemes that played on their greed. As usual, it all collapses in the end, but not before much damage was done." So far the book has been a great insight into the creation of the junk bond market of the early 80's, led by Michael Milken of Drexel Burnham. It requires a basic knowledge of finance and bond markets, otherwise the reader will get lost in the names and deal sizes. A little dense at times, but a great read nonetheless. it's a short book but not an easy read however it is worth the 5 stars not because it is impossible to put down but because it is so informative and so comprehensive. if you want to leearn about milken and boesky, this is the book.